HYDERABAD, TELANGANA, INDIA, July 4, 2018 /EINPresswire.com/ -- Freed from preservatives, people these days are more interested in the frozen bakery products that can be cooked on the requirement and easily stored for further use. These products can vary from simple bread to cakes, pastries, pizza crust, breakfast cereals, baking flour, and so on. The principal factor affecting these products growth are the decreased or no concentrates of gluten and the non-requirement of molds, bacteria, and yeasts in the product making. No specialized equipment is needed for the cooking and the time consumed can also be restrained. The Global Frozen Bakery Products Market has been estimated at USD 18.16 billion in 2018 and is projected to reach USD 27.16 billion by 2023, at a CAGR of 8.38% during the forecast period mentioned in our report. The increased demand for the food industry, changing human lifestyles, interest to try different tastes in a healthy manner, and exhaustive day to day works highly influence the market growth of frozen bakery products. One of the fastest growing variants of frozen bakery goods is the frosted cake. Demand for creative and premium cakes for regular or special occasions is driving the frozen cake market across the globe. Cakes are given the prime importance whether it is a birthday or marriage day or anniversary or a new beginning. This requirement of people has gained interest among different players of the market to bake different categories of cakes in rich exotic flavors. The fast food centers along with the retail chains are the most successful segments using the frozen products. The ability to immediately heat and serve the food has made these segments popular and highly successful. The augmented consumption of pizzas and bakery goods worldwide has significantly mounted the market growth for frozen bakery products. Apart from changing lifestyles and food tastes, there are some other factors influencing the growth of frozen bakery products market. Some of them include the shortage of quality time, the continuous advent of cafes and bakeries, demand for bacteria-free food, high disposable incomes of couples, more working women in different verticals of jobs, easy availability, affordable prices and others. As you can find in the full report of the market, the global frozen bakery goods market is categorized on the basis of type or products, distribution channel and geographical regions. Frozen bread creates the major share of the market revenue. The shorter shelf life of the freshly baked bread and preservative free features of frosted bread made the latter more preferred over the fresh variant. Cakes and pastries segment is another tough competitor for frozen bread across the globe with the mounting demand for artisan cakes everywhere and is predicted to grow at a higher CAGR during the forecast period. Nonetheless, frozen pizza also accounted for 30% of the market share in most of the European countries like Italy, Spain, Germany, and France. The United States and Russia also provide the largest share of frozen pizza crusts market. Although Quick Service Restaurants are growing at rocket speed, the largest market share is contributed by the retail stores with the ease of availability to customers. The desire of customers to spend on different cuisines and changing taste patterns are the key factors driving the retail chain market. The catering and industrial segments are also expected to foresee a positive increase during the forecast period. 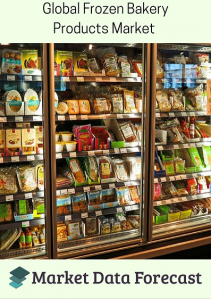 Europe with its consumption of frozen food in daily diet accounts for the largest chunk of the market share followed by the United States led North America. The vast quick service restaurants, food chains and retail stores of Europe provide the major expansion of the market in coming years. The increased tourism and catering industries in European countries like Germany, France and the United Kingdom offer extensive support to the market growth. Latin America alone provided revenue of USD 1.4 billion in 2016. Recent acquisitions like, Panattiere, a Colombia based company for frozen bakery goods by Group Bimbo, Klemme by Aryzta, Lepage Bakeries by Flower Foods, Pringles business from Procter by Kellogg Company have pointed an extensive future for the rapid expansion of frozen bakery products market in the nearby future. Market Data Forecast is a firm working in market research and business intelligence. With rich experience in research across various business domains, we cater to the needs of both individual and corporate clients. Our analyst team comprises expert professionals in market research, who with their collective knowledge and skillset dedicatedly serve clients from various industries and regions. With a well-established in-house team of experts from diverse fields and outsource research network across 100+ countries, we are the sole research providers for most of Fortune 500 companies. Along with the standards of reports being on par excellence, our unique services like free customization, analyst support for the period of six months post to the purchase will be the flag bearers and differentiates us from the rest.